Alcoholism doesn’t just impair the life of the drinker, it also causes serious distress for his or her family and friends. You’re here because you want to know how to help an alcoholic family member, which means your life is being affected by their alcoholism. Family members react to their family members alcoholism in a variety of ways and while it’s a highly stressful situation to be in, there are a number of things you can do to help yourself and your loved one through their addiction. How an alcoholic family member affects you. Having an alcoholic family member is so difficult. It will make you feel alone and lost – but you can help yourself and your family member through this. The main ways an alcoholic family member will affect your life is through physical and emotional abuse, problems caused by stress and financial hardship. 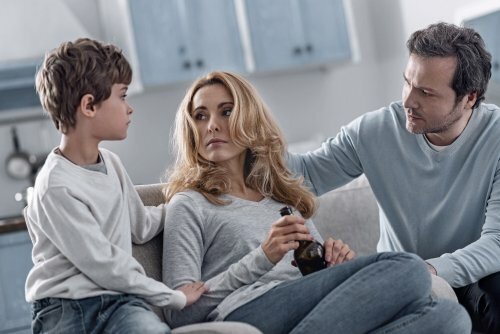 If there are children in the home, the negative impact on them can be huge, including behavioral problems, poor academic performance, mental health issues, increased likelihood of becoming alcoholics themselves or marrying alcoholics. You may not even have realised these things are even happening to you, but it’s likely your alcoholic loved one is impacting you in one or more of the above ways. Helping your alcoholic family member helps you. A direct and abrupt confrontation of your family member is certainly not the best way to go about approaching them about their alcoholism. It is likely that they will become defensive and push you away – which means they will be less likely to consider treatment and accept help. Try approaching them in a non-threatening and caring way, as it’s likely they already feel a degree of shame or guilt associated with their drinking. Don’t be judgemental or angry – talk to them about it in an open and approachable way. The best time to talk to your family member is when he or she is trying to quit drinking, which means that they have openly recognised that drinking has become a problem and are willing to try and quit. Be open about how you feel – not to guilt them or make them feel worse, but to help them understand your side of their behaviour. When talking about how their alcoholism is impacting your life, it’s very important that sure that you can remain calm and sympathetic without getting too emotional. Let them know that you are on their side and you are will to get them through this together. You can do this in a number of ways, such as offering to attend Alcoholics Anonymous meetings with them, finding them a suitable rehabilitation clinic and abstaining from any alcohol yourself. There are also some things you should avoid if you want to help an alcoholic family member. Avoid discussing things with them when they are drunk. It won’t resolve anything as their response will be emotional and it’s likely they won’t remember it anyway. Try not to talk down to them or patronise them as it will only add to their low self-esteem and feelings of guilt. Avoid being negative and angry with them. They are much likely to recover if you approach them with a healthy, positive attitude. Stop making excuses for them. Lying about their problem and covering the issue up is only enabling their addiction. Getting an alcoholic family member to accept treatment. When helping your family member get into treatment, it’s important that you to take time to learn about the recovery options available for alcoholism to select the best option for them. At our alcohol rehab center in Spain, we’ll give your loved one the tools that they need to end their relationship with alcohol and enjoy a life without it. We will equip you for a life without alcohol through a combination of therapies and an abstinence programme, so the future for you and your loved one can finally look bright again.